Have you hear of the vegan restaurant Vedge? This upscale Center City restaurant does amazing things with vegetables, and is justifiably famous outside of vegetarian circles – in fact, chef / owners Rich Landau and Kate Jacoby have won numerous awards for Vedge, which is widely considered to be one of the best vegan restaurants, and restaurants period in the country. If you’re in Philadelphia, it’s definitely worth a visit, but even if you’re not, you can get a taste of the inventive, flavor-forward, vegetable focused menu. I just got my copy of the new Vedge cookbook, and I’m so excited to work my way through it. I’m most struck by how simple most of the recipes are, and with not many ingredients, but the flavors really shine. 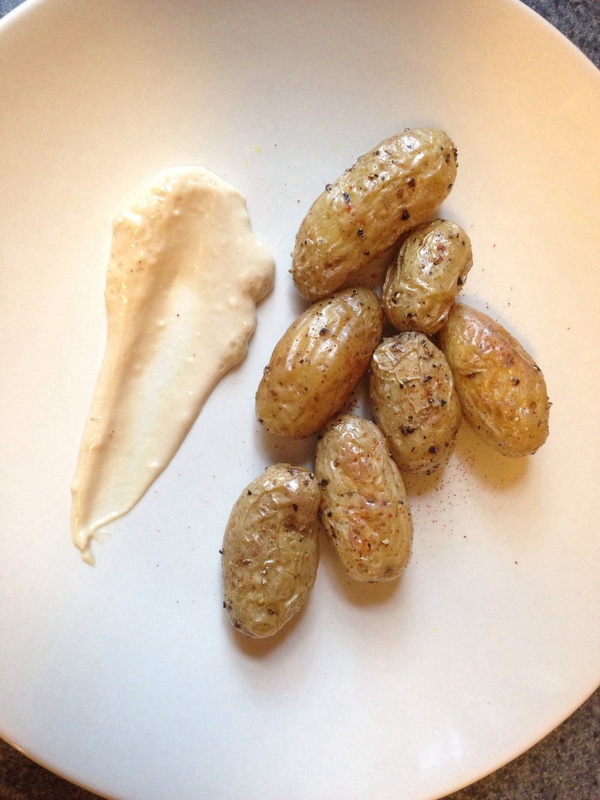 For a recent fancy picnic I brought their Fingerling Potatoes with Creamy Worcestershire Sauce. This time of year, new potatoes are so buttery and perfect, and the roasting, combined with the savory mayonnaise, really highlights this Spring treat. I know that Worcestershire sauce is usually not vegan, but it is possible to find both vegan mayos and worcestershire if you would like to keep the recipe vegan. Landau and Jacoby suggest smashing the fingerlings and tossing them with the mayo sauce, but since I was looking for a finger food, I kept mine whole and served the sauce on the side.